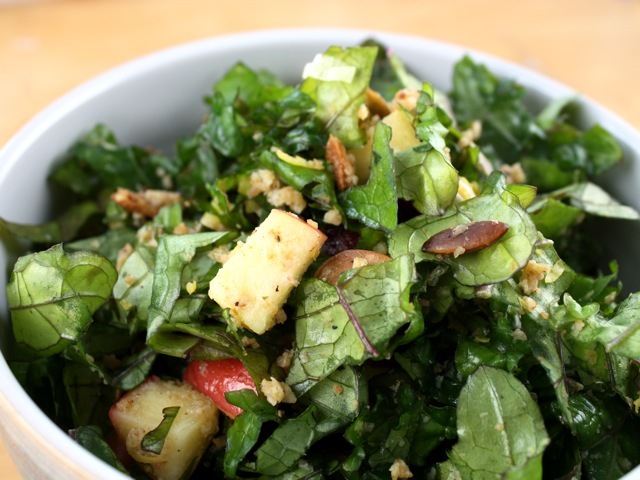 In late 2011, raw kale salads became trendy, and even people who normally shunned kale in all forms were embracing the concept. It's true that kale sounds like a literal tough sell in the salad department. But if you slice kale leaves very thinly, and dress them lightly in a tangy dressing, you get a fresh, chewy, crunchy salad without the wilting fragility of lettuce. Younger and smaller kale leaves, of course, do better here than the older, tougher leaves of mature plants. However, any nice, fresh bunch of kale from the farmers' market or decent supermarket will do. And if you're still not sure about eating a thick, bitter green as a salad base, try writer Russ Parsons' suggestion to massage the leaves to break them down a bit first. This recipe riffs on a salad created way back in 2007 by the writer Melissa Clark and further adapted in late 2010 by the blogger Heidi Swanson. Theirs are very simple — just kale, breadcrumbs, and dressing. Mine has a variety of add-ins for extra crunch and sweetness. Feel free to riff and make up your own version, depending on what you've got on hand. Or add grains, as in the popular Emerald City Salad, for a main dish. Remove the kale leaves from their stems, and discard the stems. Slice the leaves into thin ribbons, then slice them again crosswise into bite-size pieces. Set aside. Put the breadcrumbs and pumpkin seeds into a dry cast-iron skillet and toast over medium heat, stirring frequently, for a few minutes until lightly toasted and browned. Put the toasted breadcrumbs and pumpkin seeds into a large bowl. Add the grated Parmesan, cranberries, scallions, diced apple, minced zest and fresh juice of the lemon, olive oil, and salt and pepper. Lightly mix these ingredients together. Add the kale leaves and gently toss everything together with your hands. Serve immediately. This salad will store well in the fridge for a day or so.